If you’re a homeowner, landlord or housing association in need of professional domestic electrical installations in Stafford, look no further than Orbis Engineering Services Ltd. Based in Stafford, we are the area’s leading electrical engineers and we can cater for all areas of electrical work within the home, from complete rewires and lighting installations, to installing household appliances, fire safety alarms, external power supplies, solar panels, and even electric car chargers. No matter how big or small your needs may be, through our wealth of experience and industry knowledge, we can provide a safe, reliable and cost effective solution when you need it most. 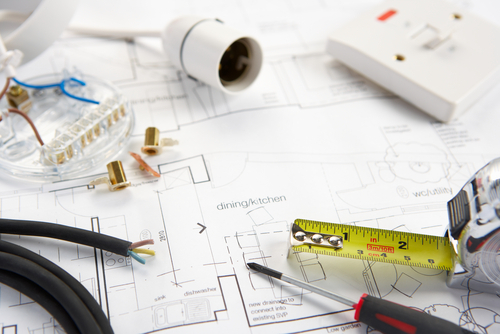 Why Choose Orbis Engineering for Your Domestic Electrical Installations in Stafford? Choosing an engineer for your domestic electrical installations in Stafford can be a difficult task which involves lots of scrolling through search results on Google to find the best supplier. The trouble is that this can be time consuming and some contractors can have a reputation for cutting corners or charging extortionate rates. At Orbis Engineering Services Ltd however, we take great pride in always delivering an exceptional level of good workmanship at a competitive price so you get the best possible service and deal. We are NICEIC and CHAS accredited and every member of our friendly and dedicated team carry CSCS cards. This is the leading skills certification scheme within the UK construction industry and it provides proof that we have the required training and qualifications for domestic electrical installations in Stafford. To put it simply, with Orbis Engineering you’re guaranteed a safe, comprehensive, and reliable service. So, if you’re looking for electric contractor for domestic electrical installations in Stafford, look no further. At Orbis Engineering, we offer a professional service with minimal disruption to your home or property. To discuss your project in more detail, please contact a member of our team today. In addition to electrical installations, we also specialise in electrical testing and maintenance and repairs of your systems and appliances to ensure that your home is safe and that your appliances and systems function effectively.